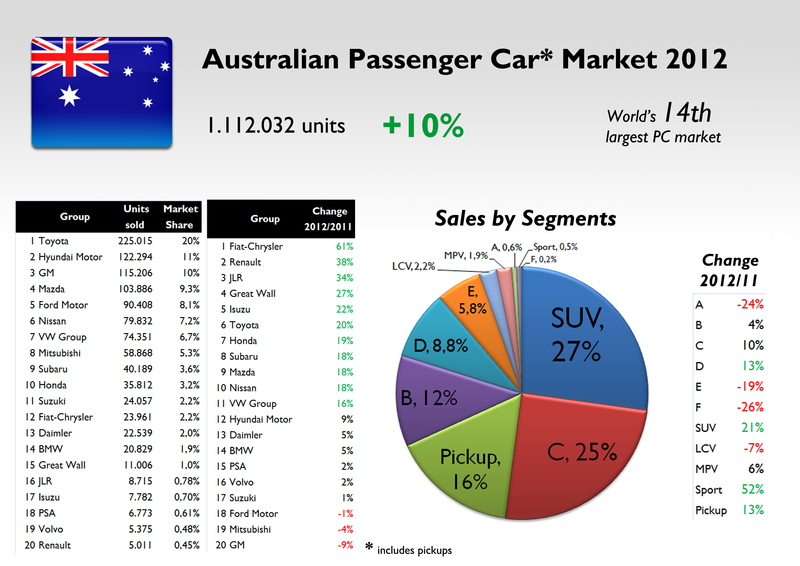 Australia was the world’s 14th largest passenger car market in 2012. More than 1.1 million units were sold, with a healthy positive growth of 10%. If this trend continues (YTD numbers indicate sales have advanced 4%*), this market could outsell Italy soon. Last year, SUV segment counted for the biggest part of car market, with 27% share. It was followed by C-Segment, and far by the Pickups. The growth was possible thanks to more mid-size SUV, C-Segment, and mid-size pickups on the roads. The biggest falls came from the city-cars segment, E and F segments, and mid-size MPVs. Australians love trucks and compact cars, while they don’t really appreciate minivans. It is in a way a small US market. The composition of the market by car makers is quite interesting. Toyota is the leader and in 2012 it increased the gap with the second position, Hyundai, thanks to an excellent performance, (+20%). But last year two important facts took place: both ‘locals’, Holden and Ford, were outsold by two foreigners. GM (Holden) was outsold by Hyundai-Kia, while Mazda sold more cars than Ford. Certainly it wasn’t a good year for the American brands. The new Corolla and Mazda 3 had a big impact on their brand’s sales, while the big Holden Commodore and Ford Falcon shrinked. VW Group is the first European in the ranking, at 7th position, and is quite strong with the VW brand. Fiat is the second largest European group with an awesome growth of 61%, the best of the ranking. Fiat-Chrysler was the group with the highest growth year-on-year. Source: see at the bottom of this post. 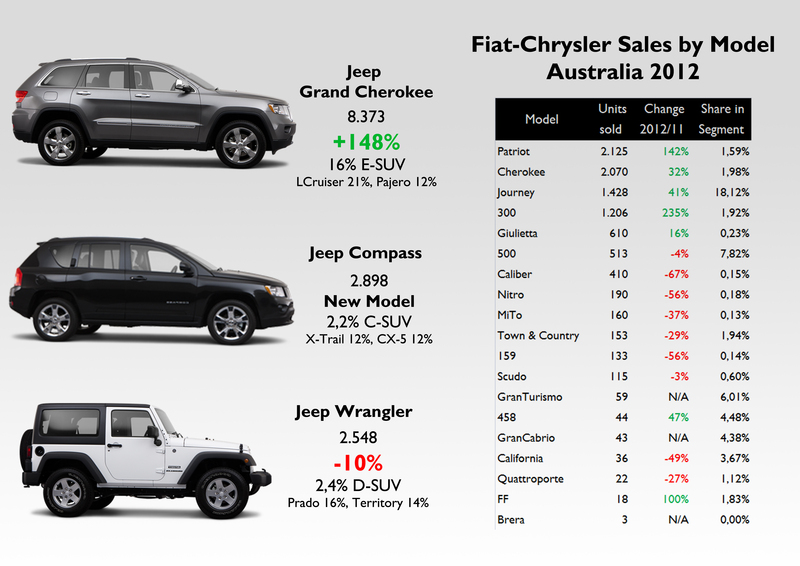 The good result of Fiat-Chrysler in Australia is due to Jeep’s excellent performance, up 108% or almost 10.000 units more. This jump, along with Chrysler brand’s positive growth (+134%) were enough to offset the fall of all the other brands of the group. 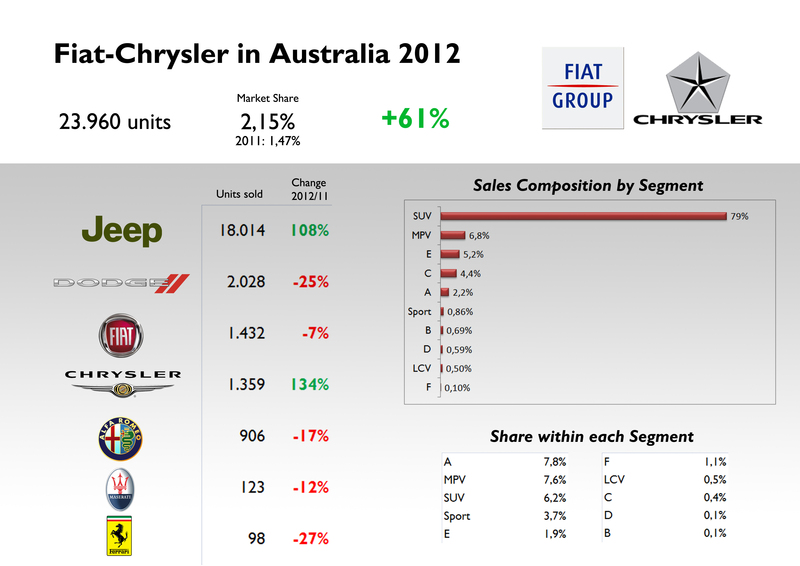 Fiat and Alfa Romeo lost positions mainly because of the high prices and the arrival of the VW Up! which had a negative impact on the 500’s sales. This bad performance has changed for good in 2013, thanks to better prices and the fact that the 2 brands are now part of Chrysler distribution. Almost 80% of the group’s sales are SUVs, followed by MPV and E-segment. Certainly small cars are not the key products. Jeep brand counted for 75% of the group’s sales. F-C gained 0,7 basis points of share, one of the highest in the country. Almost 80% of the group’s sales corresponded to SUV-segment. But once again, its share in City-car segment is the highest, with 7,8% against 6,2% in SUV-segment. Source: see at the bottom of this post. All Jeep products ranked first. The Grand Cherokee was the second best-selling large SUV! The Compass did quite well as a new product, while the Wrangler lost some positions. The Journey got 18% share on D-MPV segment. Source: see at the bottom of this post.